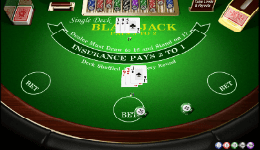 In the early days of casinos and till the 70s, Single Deck Blackjack was one of the most popular games. The smart gambler knew that this was the best game being offered and took advantage of its very low house edge. 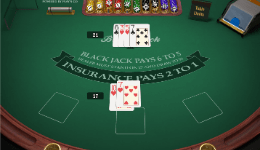 While other games in casino had a house advantage as high as 15% or more, single deck blackjack offered the player an unheard of 99.85% payout. The house still has an edge, but it was by far the lowest of any game you could find. To make it even better, savvy players learned that counting cards made the advantage tilt towards the players. There is no game in a casino where you can make this happen so easily as in Single Deck. However, the casinos caught on to this and quickly adjusted Blackjack rules to increase the house edge. This is why these days, most blackjack games are played with 4 decks or more. In most cases, 6 to 8. Simply adding a few decks brought the house edge up to 0.50% or more, depending on the various rule changes. And it also made it much harder for card counters. Even though single deck Blackjack has become scarce, some land based casinos are starting to bring the game back to life. But beware, the game isn’t what it used to be. It may look the same at first glance; but when you take a deeper look, you will see just how different single deck Blackjack has become over the years. However not all news are bad. 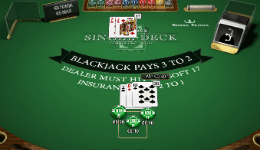 Online blackjack players can still enjoy few Single Deck Blackjack games with favorable rules and 99.83% payout. There few variations available online and you can try them out for free. 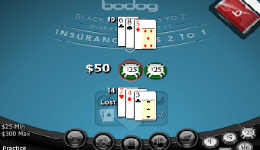 There are even two Single Deck Blackjack games for USA players, one developed by Bovada casino, the best payout casino online, and the second by BetSoft. The payouts rules of all Single deck games are quite similar, however the rules vary a lot from one version to another. Here you can find the basic set of rules, and below we will compare the differences between the games. Dealer doesn’t check for blackjack (similar to European Blackjack). 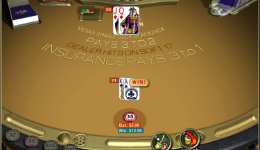 When the dealers face card is Ace, you are offered insurance. You can split similar value cards. You can hit or double down after splitting, but split Aces receive only one card. If you have a blackjack and the dealer face-up card you are offered even money. Here you can find the unique rules each game has. For your convenience we’ve also added some valuable points, such as the stake limits, the number of hands you can play and US friendliness. Dealer checks for blackjack on 10 value cards. Double on any two cards and after splitting. High minimum bet of $25. No doubling down on split hands. Multi-hand: up to 3 hands per round. Doubling down only on 10, 11 value hands. A and 10 after splitting counts as 21 and not natural. 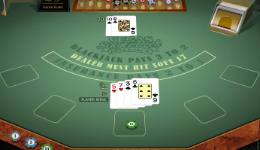 Dealer peaks for Blackjack on 10 value cards. Ace and 10 after splitting count as 21 and not natural. Double down only on 10, 11 value hands. No double down on split hands. Ace and 10 after splitting count as 21. Lowest minimum stakes of 10 cents/pennies. Blackjack pays 6/5 – Highly not recommended. The other change was how Blackjacks are paid out. This is where the game took a wrong turn for the worse. At least for the players. 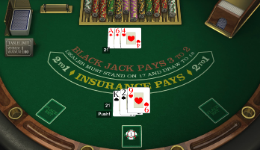 In most Blackjack games, a Blackjack pays out 3:2. However most land based casinos changed the blackjack payout at their single deck tables to 6:5. This may not look like a big deal, but it actually raises the house edge by 1.5%. That’s a lot! What once was a game with the best odds, has now become the worse form of Blackjack to play. It’s considered a sucker bet, or a ploy to attract unsuspecting players into its trap. If you can find a brick and mortar casino that offers single deck game that pays the traditional 3:2 on Blackjacks, you should play it. Otherwise steer clear or just play blackjack online, where you can still enjoy favorable rules and odds.